Natasha is a systems/organizational-maven, who helps service professionals to get more done in less time by systemizing, automating and delegating. She comes to their rescue when they just can't get to the stuff that matters, because the stuff that doesn't matter always gets in the way. Natasha creates systems that help her clients get more done in less time and pave the way for greater profits and long-term success. 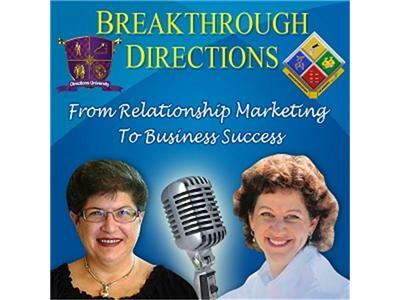 Join us for "Breakthrough Directions" as guests share their secrets for building relationship capital, relationship marketing and internet marketing strategies, and offline & online business systems that have created huge success for thriving businesses. JAiring weekly on Tuesdays at noon eastern and in permanent replay, come learn how you can apply these secrets to succeed in your own business as well! In between episodes, you can get help any time you need it through the FREE DirectionsU "30-Day IM Challenge" that walks you through applying the internet marketing strategies and online business systems, and the Breakthrough Academy "GOLD Program" for growing a thriving business. They show you how to apply what you learn about on the show to YOUR business, step by step!